While not a huge fan of roster shots and preferring moving trains, sometimes you just have to depress a shutter on some nice looking SD40-2's that are basking in the sun. The Wisconsin & Southern power was laying over in Belt Rwy. 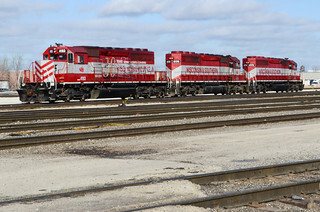 of Chicago's Clearing Yard in Bedford Park, Illinois. Don't let that sunshine fool you though, the windchill was well below zero this afternoon during this shot. WAMX 4183, the 30 year anniversary unit, started life as UP 8007 in June of 1974. WAMX 4178 started life as MILW 199 in May of 1974. WAMX 4179 started life as UP 3186 in July of 1972.